When it comes to air conditioning replacement in Denver, look no further than SWAN Plumbing, Heating & Air of Denver, Inc. We fully understand the concerns of customers when it comes to making a big decision like which company to trust to replace their air conditioning unit and strive to make the process as transparent, honest, and hassle-free as possible! Or, click here to schedule your air conditioning replacement service online. We carry, and install, all the top air conditioning brands available and our professionally trained, industry certified, installation experts will go over with you which air conditioning brand and model would best suite your needs based on the specifications of your home. 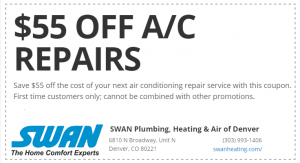 If you've decided that it's time you got your air conditioning unit replaced, and want the job done by a company that you can trust, and will provide you with a stress-free experience, all with the lowest pricing available in Denver, while maintaining highest quality, then count on SWAN! Our knowledgeable air conditioning installation experts will identify the best air conditioning brand and model to fit your homes specifications so that you can make the most informed decision possible, which is why we've become one of the most trusted Plumbing, Heating & Air Conditioning company in Denver!